This small town is quite popular among tourists who like to experience the authentic lifestyle of Kerala and heal in the lap of nature. In the heart of Kerala lies a little gem called Kumarakom, which is famous for the lush backwaters and picture-perfect scenery. In the heart of Kerala lies a little gem called Kumarakom, which is famous for the lush backwaters and picture-perfect scenery. This small town is quite popular among tourists who like to experience the authentic lifestyle of Kerala and heal in the lap of nature. Full of lakes and forests, Kumarakom has picked up as a popular destination in past few natural years as a marked rise in wellness tourism attracts many Indian and foreign tourists to this town for Ayurvedic treatments and naturopathy. One of the biggest highlight of this quaint town is the massive Vembanad Lake, which is also the largest lake in Kerala, and covers the major parts of the city. Although, summers are not an ideal time to visit Southern states due to strong sun, in Kumarakom the weather is mostly pleasant throughout the year due to the expansive water body that surrounds the city. In fact, monsoons are the peak season among tourist who like to visit the green vegetation and natural freshwater life in the lake during rainfall. The town of Kumarakom has been declared a special tourism zone by the Kerala State Government, and most of the touristy places are situated around the lake – encouraging people to experience the backwaters of the Vembanad Lake and indulge in local activities like boating, yachting, and fishing with the locals. Surrounded by exotic flora and fauna, most resorts in the city offer curated itineraries to the guest. If you are fond of an al fresco dinner under the stars, a cookout with the chef learning traditional regional recipes, an evening at the deck overlooking the lake, a candlelight dinner in a houseboat or healing spa therapies by trained Ayurvedic practitioners then this town should be on your bucket list. If you are interested in shopping, then do check out the nearby markets and pick up some handmade off-white cotton saris with a signature gold border and for men, you can pick the cotton dhotis known as mundu. One can also buy the delicious banana chips, prawn pickles, spices, Ayurvedic oils, soaps and balms for gifts or souvenirs. And, if the budget is not a problem for you then do check out the gold jewellery market and maybe buy something for your loved ones. One can find a lot of luxury and budget resorts/ hotels around the lake area, where tourists come get to stay among breezy coconut palms and tropical foliage. As I am a big fan of exploring local culture and lifestyle, I chose to stay at the Niraamaya Retreats Backwaters & Beyond, where I also got to experience Kerala’s classical dance, music, food and arts with scenic houseboat tied with knots (popularly known as kettuvallam) cruises on the lake. While you are in God’s country, enjoy the delicious meals and the variety of seafood (prawns, fish, shrimp, lobsters, etc) prepared using local spices and herbs. If you are vegetarian, then you must try the extensive traditional food called Sadhya, which is usually prepared during the Malayali harvest festival Onam. The lavish spread of rice, dal, vegetables, curries, chutneys and pappad on a banana leaf is eaten with hands and the simple homemade flavours of these delicacies with satiate your inner foodie. The local tourism is designed to promote the rural life experience in Kumarakom, and one can hire a local boat to navigate through the backwater canals around the lake. If you are lucky, you will be able to spot the swarming rice fields, full bloom trees, and lush landscape. 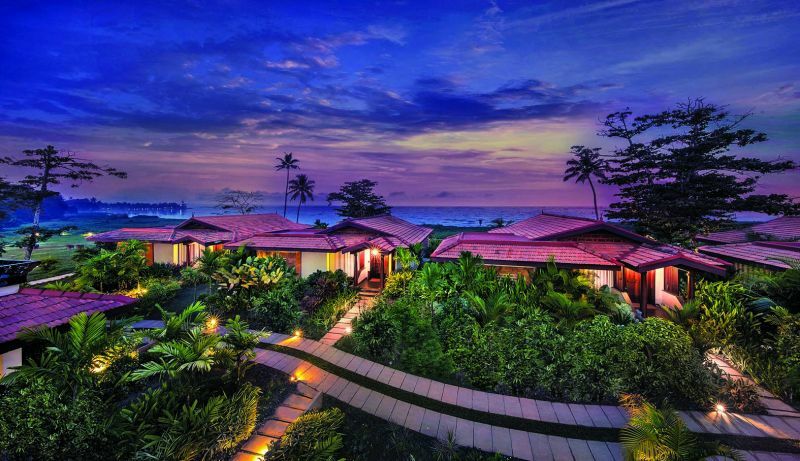 A key highlight of the retreats in Kerala revolves around the concept of wellness and holistic rejuvenation. Here, many trained therapists and life coaches provide their expertise and offer courses in relaxation, meditation, and yoga. Tourists, who specially visit Kerala for treatments can choose from traditional Ayurvedic therapies, tailored wellness immersions, structured diets, and healing exercises to get cured naturally. One of the most popular attractions in this town is Kumarakom Bird Sanctuary, which is open on regular days for all visitors. The bird haven is a protected forest area, where local and migratory birds can be spotted in different seasons. A little ahead of the town is the famous Aruvikkuzhi Waterfall, which is also near the rubber plantation farms and is open for guests. 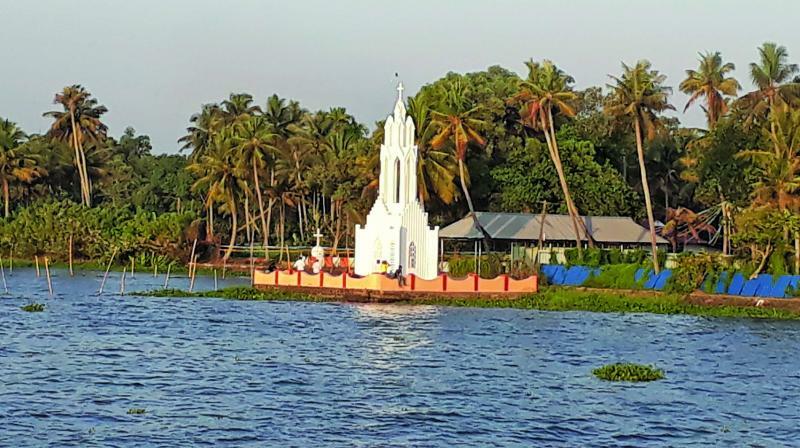 While history lovers can take a tour of the Bay Island Drift Museum near the Kumarakom beach and visit the local churches to gather some interesting tidbits about the place. Located near the city of Kottayam (16 kilometers away), which is also the closest railway station to reach here. Whereas, the nearest airport to this town is the Cochin International Airport, about 70 km away from the Muhamma boat jetty and the next closest is Trivandrum, which is approx 170 km away. So, check out this rural beauty and don't forget to carry your sunscreens and breezy resort wear as you soak in the wonders of rustic backwaters in the pristine God’s own country.